"We LOVED it. It was our first time and I can already tell that I will be back for more. Yall were super friendly which makes it even better. Next time I will bring my keys." "This was an amazing time! The hosts were very courteous, accommodating, and thorough with explaining everything. I'll admit that every member of our 6 person group was nervous because we didn't know what to expect. Everything was very well explained and assured. Great, great experience and we are looking forward to visiting Suite." "What a great way to spend time and bond with friends and family! Everyone had a great time, and we can't wait to go back!" 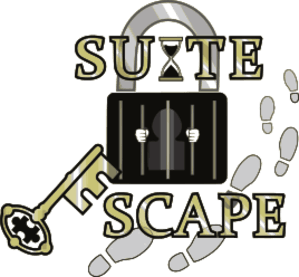 My family and friends love the escape rooms at Suite Escape! The idea is to use your wits and senses to figure out codes, puzzles or riddles to obtain clues to unlock the door. Suite Escape is unique in that they utilize original "homemade" ideas and do not purchase duplicate ideas that are reused by other competitor Escape rooms. Therefore, you will never see the same room anywhere else. Suite Escape is challenging and fun for the entire family!! Had a ball with my 2 very smart grandsons! They saved me from handcuffs and a ticking timebomb! Enjoyed the friendly staff! Thanks for the fun. That was the fastest hour we ever experienced! Lots of fun, very challenging, very exciting! Can't wait for another room to escape from... Or almost escape from! We took a group of youth kids and tried 2 rooms. The kids really enjoyed it and asked when they can do it again! Thank you for the effort that went into the rooms! We will be back! We had a great time. We jumped right into the toughest room and failed but learned. We will go back and try again. We had a blast ! Will definitely be back ! That's for being a great host & for a great experience! What a great way to spend time and bond with friends and family! Everyone had a great time, and we can't wait to go back! Best entertainment in town for those doing the rooms and for the management. Keep it going. We had lots of fun!! Will definently be back to take on the next challenge!! THANKS for giving Amarillo something different for entertaining ourselves! So much fun! They do a great job at making this an amazing experience. I know I'll be coming back. So much fun! Thank you for a good time and unique experience! Had a wonderful time!!! Recommend to every one of any age! Had so much fun!! A must do! Great time! Fun and challenging.